While I have only spoken ill of a couple of the snack bars/breakfast bars that I have tried going gluten-free…I believe my quality standards have been raised. I love Glutino to death, I do…but, while I don’t dislike their snack/breakfast bars, they are a little bit…tasteless when compared to the amazing bars I have had the chance to devour this past week. And I owe this all to Van’s. Yes…Van’s. Van’s who makes the best gluten-free waffles. Amazing gluten-free cereal. And have since branched out into other products, such as gluten-free crackers, chips, granola, pasta, and yes…snack bars and granola bars. And some of my local stores have started to carry some of these other products from Van’s…and I couldn’t be happier about it. Usually during the day, I have two snacks because I eat a good breakfast, a light lunch, and a sensible dinner. I snack in between breakfast and lunch and lunch and dinner. Yes…even when I’m not running. But I am generally very specific about what I choose to snack on. Currently, however, I am attempting to whittle down some of the products I have accumulated in my freezer and pantry. So, by checking out expiration dates, I began to go in order. And this week I finally cracked open my box of snack bars from Van’s Gluten Free. While the store I purchased these snack bars at had many to choose from, I selected Van’s PB & J Strawberry and Peanut Butter Gluten Free Snack Bars because…I’m addicted to peanut butter for one thing…and I love a good peanut butter and jelly sandwich. Seriously…it’s one of the simplest pleasures in life. And not one that I indulge in too often as gluten-free bread is stupid expensive. But…I figured this might be a good way to enjoy one of my favorite things to eat. This past week…I got to see for myself. Wednesday morning…around 10:30 am, I tore into my little wrapped snack bar. It looked like a slap of peanut butter with a jelly middle…sort of like a sandwich minus the bread. I was intrigued. I could see the oats rolled into that peanut butter layer and really couldn’t wait to take a bite. A picture for the blog had to come first though…despite wanting to rip into it. It smelled amazing…like peanut butter and jelly…so it was already living up to its name. I snapped a quick picture and then tore off a corner to take a bite. WOW! This bar is truly like eating a delicious peanut butter and jelly sandwich. The strawberry filling is sweet without being too tart or too strong. It just is this layer of sweetness that totally works with the savory peanut butter that encompasses it. The rolled oats give a great texture, making it seem like a real sandwich. Each layer of texture and flavor brings a whole new level of deliciousness to this bar. They are soft and chewy, just like a sandwich should be. 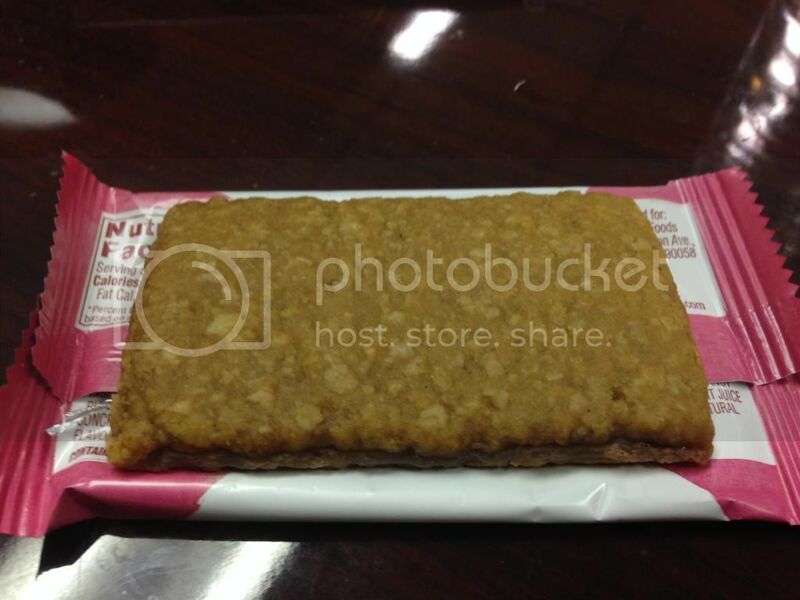 And none of that “like cardboard” outer crust that a lot of snack/breakfast bars have. Every bite brings 10 grams of nutrient-rich whole grain oats and real peanut butter…which definitely makes each bar a nice and filling snack. Honestly, I’m rarely ever starving when lunch time rolls around, and I find myself delaying it slightly because this little mighty bar of peanut butter and jelly goodness has done it’s job as a snack. Beyond impressed. 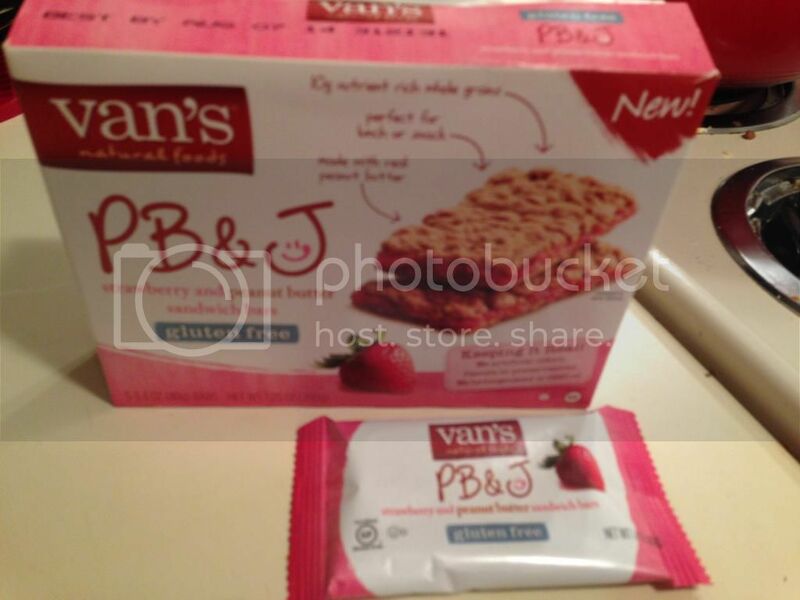 Let’s take a look at the ingredients and nutrition information when it comes to Van’s PB & J Strawberry and Peanut Butter Gluten Free Snack Bars. As far as ingredients go, the Van’s PB & J Strawberry and Peanut Butter Gluten Free Snack Bars are made from gluten free oats, invert cane sugar, peanut butter, non-GMO expeller pressed canola oil, sweet rice flour, strawberries, apple powder, fruit juice concentrate (pineapple, pear, apple and peach) tapioca starch, rice bran, peanut flour, peanut extract, glycerin, natural flavor, citric acid, pectin, locust bean gum, sea salt, red cabbage extract and annatto (for coloring), and baking soda. These bars are gluten-free and dairy-free. In addition, Van’s, as always, states that these are ingredients that they are proud of. I can totally see why! As for nutritional information, a serving size of the Van’s PB & J Strawberry Peanut Butter Gluten Free Snack Bars is 1 snack bar. One bar has 160 calories and 6 grams of fat. Don’t worry, much of that comes from the peanut butter…and that is a healthy fat. These bars are cholesterol free, contain 115 mg sodium, and a (rather high) 14 grams of sugar. I guess that has a lot to do with the fruit and fruit juices that are inside each bar. A little high in sugars, but the 2 grams of fiber and 3 grams of protein help make up for it, making it more than a sweet treat, but a filling snack. Honestly…your appetite will be satiated. Big kudos, once more, to Van’s for another amazing gluten-free treat. It just goes to prove that when you use quality ingredients (that you are proud of) you always put out a quality product. And that…that is what it is all about. The PB & J Gluten Free Snack Bars come in two flavors, currently: strawberry and blueberry. I’m a huge fan of the strawberry…so I can’t wait to get my hands on the blueberries. And the other snack bars and snacks that Van’s has to offer. It is definitely a name I can trust. If you love peanut butter and jelly…then you’ll definitely LOVE these. This entry was posted in Breakfast, Food, Fruit, Gluten-Free, Nuts, Oatmeal, Products, Review, Snack Bar, Snacks, Sweet Stuff, Vegan, Vegetarian by The Celiathlete. Bookmark the permalink.